We start by listening closely to learn what you want and need. Based on what you tell us and our years of experience, we can digitize your logo or design for embroidery so that it will look great and wears well. We make embroidered logos and designs come to life by creatively selecting thread colors and using various stitch types, angles and placement. We’ll ensure your embroidery looks great and wears well by choosing the appropriate underlay, backing, and thread weight for the fabric being used. We can convert your embroidered logo or design into a graphical version that is good for imprinting on apparel and printing on banners, decals and signs. If you don’t have an embroidered logo or design, we can help you create a unique graphical logo or design that looks sharp and professional rather than ordinary. We use a variety of media, each designed for a special purpose. For decals and signs that will be displayed outdoors, we apply a clear protective layer using a commercial laminator to reduce fading and scratching. 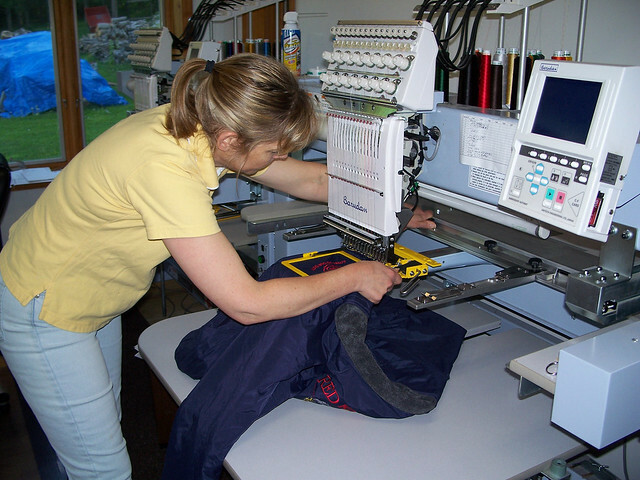 At each step of the embroidery, imprinting, and printing process, we pay attention to details. Using our extensive list of distributors we can provide casual, corporate, team, and work apparel that fits your budget and style, including hats, jackets, shirts, sweatshirts, and firefighter work shirts. Private label and brand name apparel like GAME, Adidas, Nike, Champion, Eddie Bauer, to name a few, are available at below MSRP if we do embroidery on them. We can also order apparel that is made in the USA.